Today I have been revamping the home office/library area in our home. This is really a follow up post to one I wrote in January which you can read here. 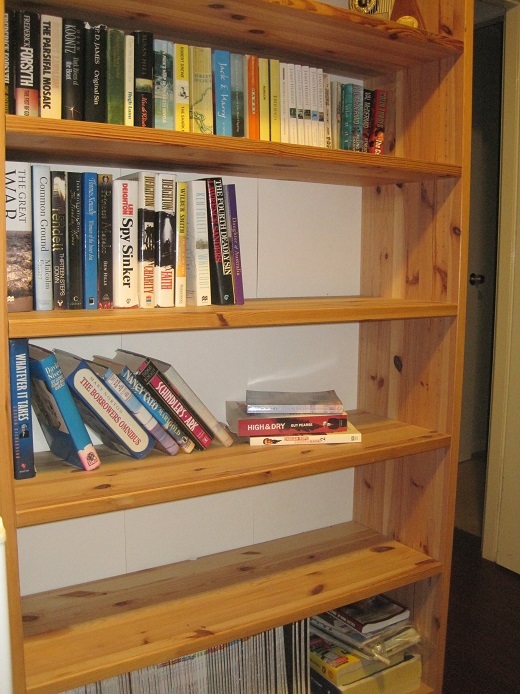 I finally moved the Australian Geographic magazines to the bottom shelf of the shelving unit in the lounge room and finally the bookcase was empty. I advertised it on a couple of local Facebook Buy, Swap, Sell sites and it looks as though it will be going to a new home tomorrow. This is what one side of the office looked like a couple of years ago. 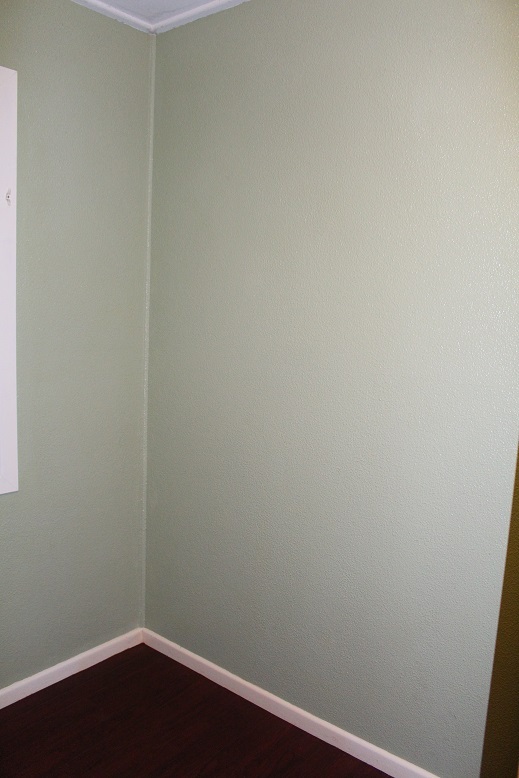 The freezer has been moved downstairs and with one bookcase ready to go we now have this blank corner. I am planning to get a comfy chair to put in the corner and create a reading nook. Meanwhile, on the opposite wall we have a folding trestle table which we use as a computer desk. This was always only a temporary measure but it has been like this for nearly 10 years! After much searching I have found this piece at IKEA. I have only seen it online but hopefully it will measure up to my expectations. 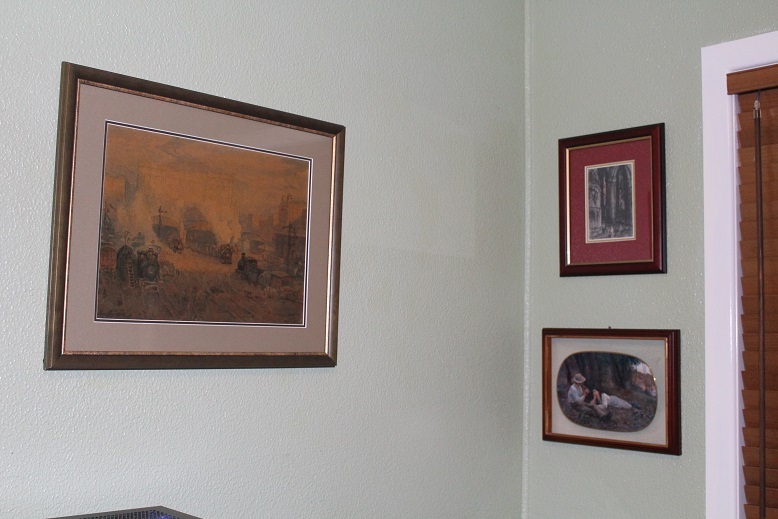 The look of the room has been changed by re-arranging some of the artwork we have. These are above the computer desk at the moment but if I end up getting the IKEA desk I will relocate them to the other side so they will be above the reading chair. Here are a couple of others which have also been changed around. The office/library is a rather strange room due to the fact that the house was extended many years ago before we bought it. This room was originally the main bedroom at the end of the house, however, it is now a walk-through room to the additional bedrooms. 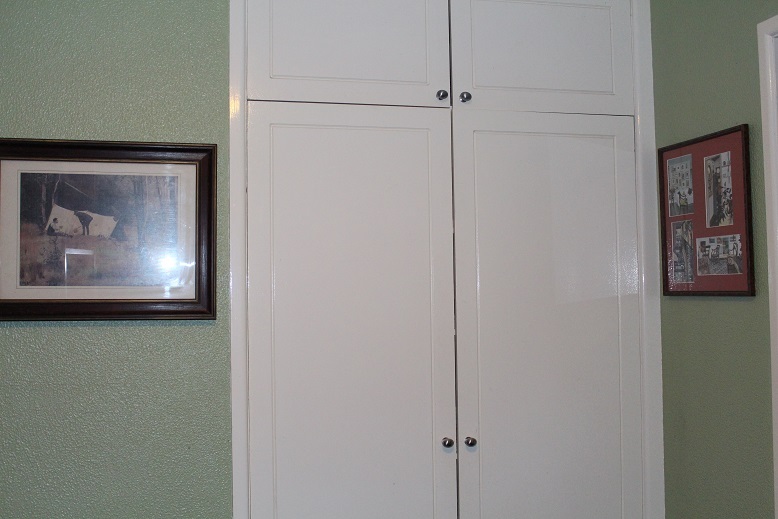 The cupboards in the above photo would have been the original wardrobe. 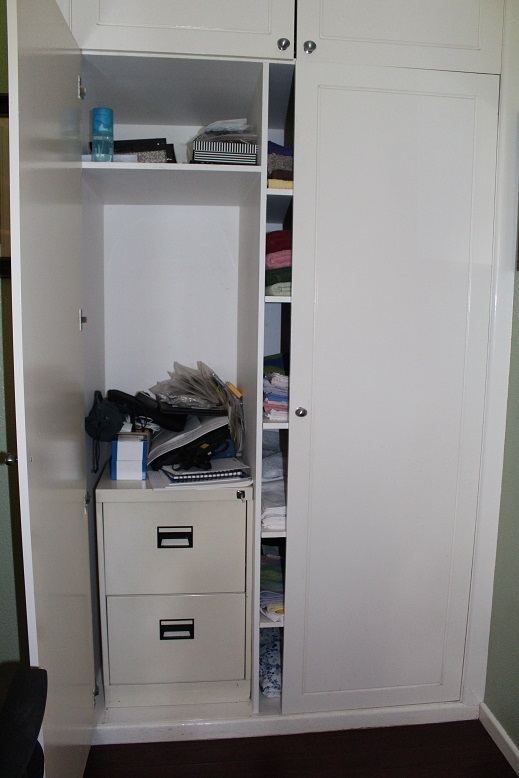 The right-hand side is my linen cupboard and the left-hand side holds the filing cabinet. As you can see from the link in the first paragraph, we downsized from a 4 drawer filing cabinet to a 2 drawer one. This left plenty of space but it was not particularly functional. Today, we have cut down an offcut of melamine coated shelving and created a new shelf. There is still more to do but I feel as though I a winning the battle to make the office/library into both a functional and pleasant space. This morning I decided to clean the bookshelves in the office area. I knew that they were quite dusty and that there was some stuff lying around that really didn’t belong there. 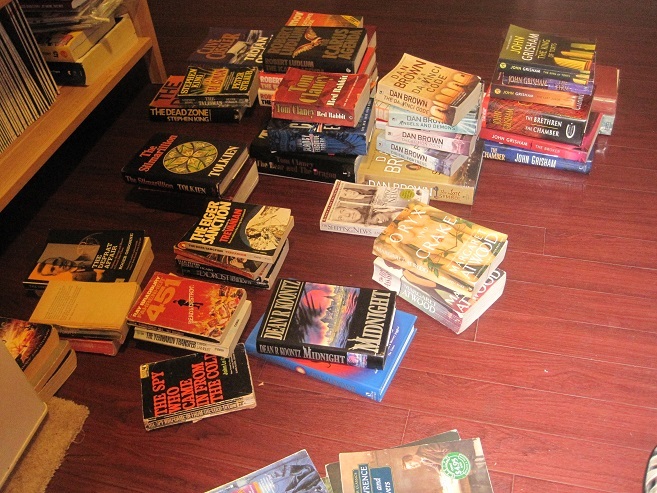 As I started to remove and clean the books I decided to sort them out and see if I could cull any more. Getting rid of books seems to be fairly difficult for us but in the end there were nearly 60 books that have not made it back onto the shelves. 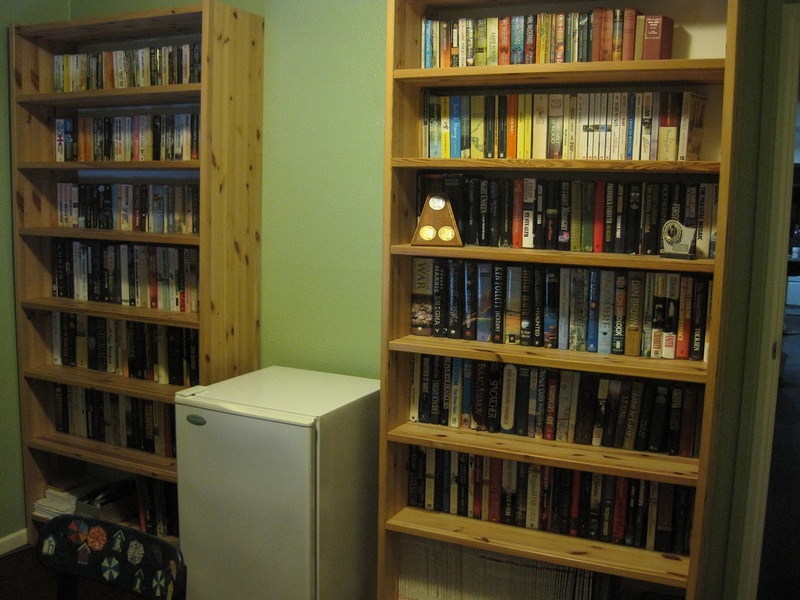 We have 2 identical tall shelving units from Ikea and it now looks as though one of them may be able to go to a new home. I am confident that we will never need more shelf space as we both have Kindles and buying a physical book is a rare occurrence. 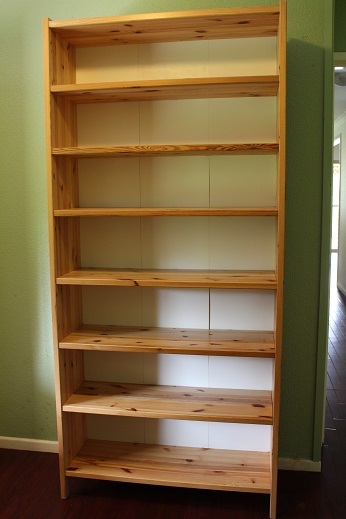 Here is one shelving unit cleaned and all of the shelves filled with books. 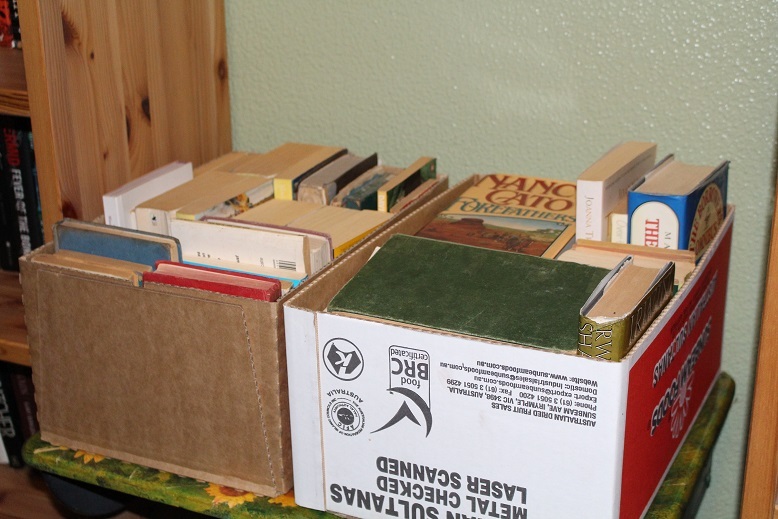 These are the 2 boxes of books which will be finding new homes. The other unit is a work in progress. 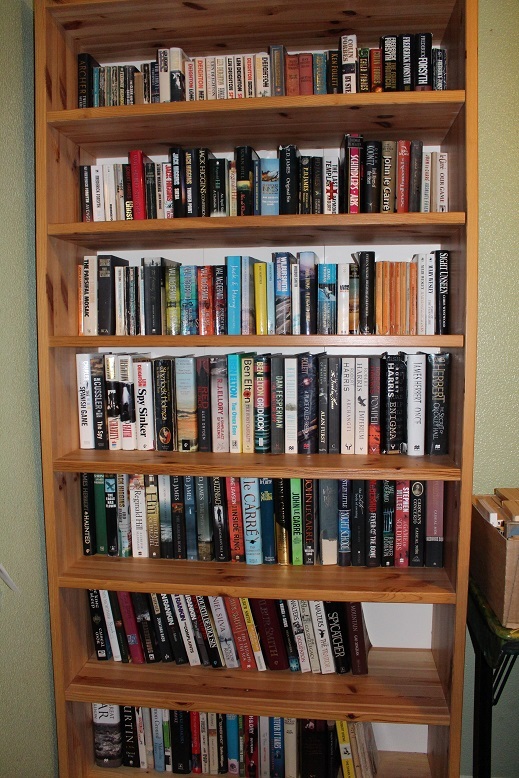 As you can see, there is quite a bit of spare space on the other shelf which is the reason I think that it can go. The random books are ones that I am unsure as to whether they should stay or go. I intend to re-read them and in fact read some for the first time. Why didn’t I read them when I first got them? Maybe I did not really like them. Anyway, I will be working on this pile over the coming weeks and deciding which ones I want to keep long-term and which can go. The collection of Australian Geographic magazines will need to go elsewhere – probably the bottom shelf of the shelving unit in the lounge room. There is 23 years worth of them – we stopped subscribing at the end of 2011. I have never read them all so maybe it is time I did. I used to joke that I would read them when I retired!! There is also a shoebox of stationery items which can probably go in the cupboard. Then there is the pile of photos that need to be sorted any scanned…………one day!! 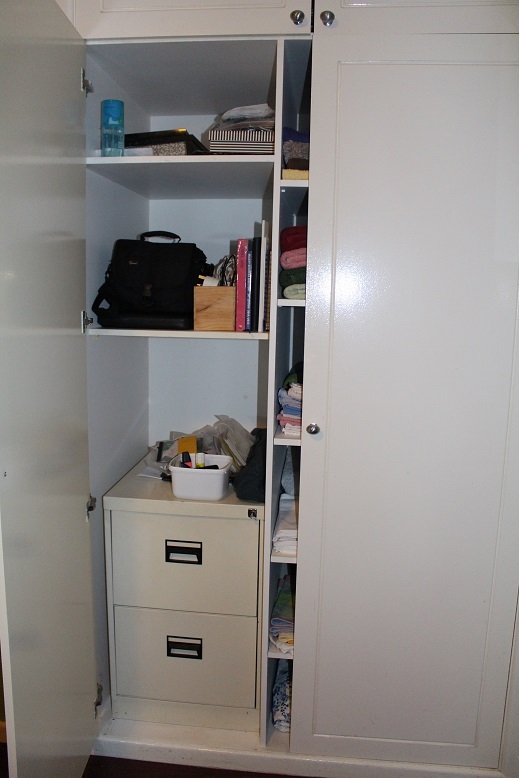 This is the cupboard which holds the 4 drawer filing cabinet. 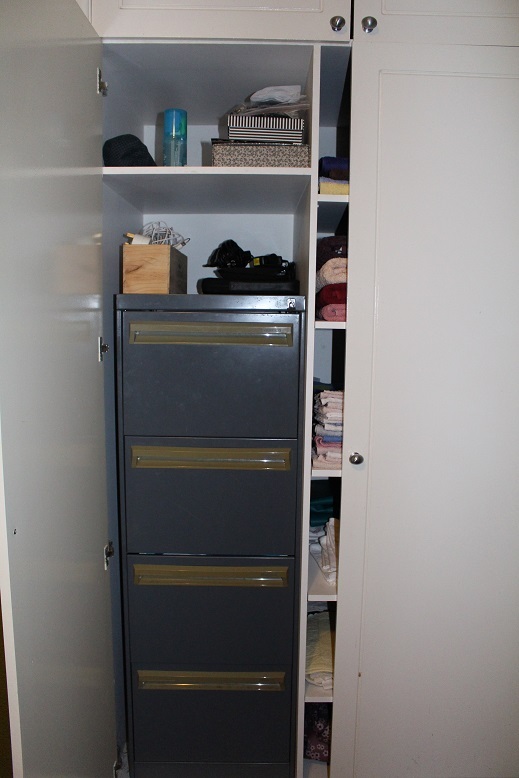 I am in the process of trying to source a 2 drawer one to replace it as we have condensed the contents into 2 drawers. When this eventuates we will use the top of the cabinet as a shelf and add another shelf a bit higher up. There will then be plenty of space for the stationery box and photos. If I had to nominate one room that is difficult to declutter, then the office would be it. Mind you, we have managed to get rid of quite a bit over the past year but there always seems to be more. 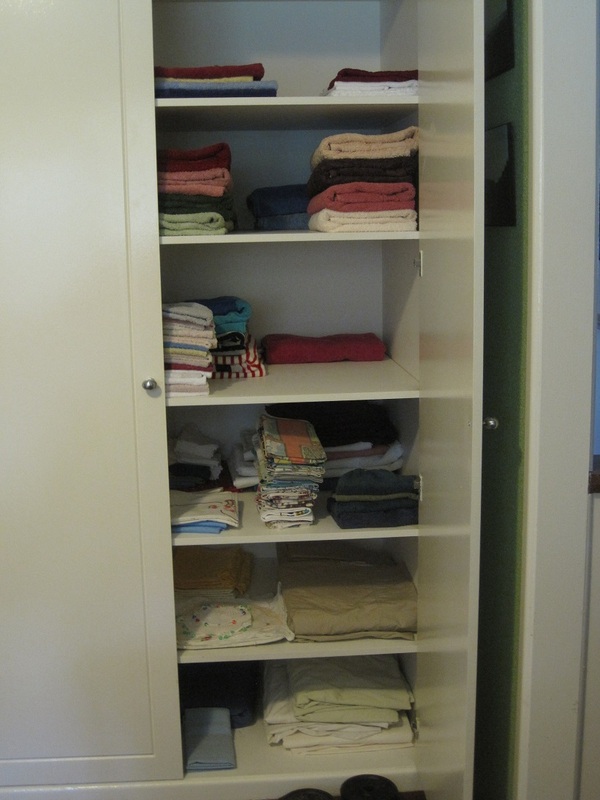 Do you have a particular room or area that is your nemesis when it comes to decluttering? Please share your stories. In years gone by our stuff was limited to a large degree by the availability and cost of most items. Goods were generally produced locally and in a relatively labour-intensive manner. Disposable incomes were less and stuff cost more when compared to incomes. Global manufacturing and transport, cheap labour and distribution have meant that there is a seemingly endless supply of stuff for you to purchase at your local shopping mall. Since the natural limits of accessibility and affordability have been removed, it is up to us to take control or we will end up drowning in our stuff. The ultimate limit is the size of your home; you can fit a lot more in a 2 storey, 4 bedroom family home than a studio apartment. 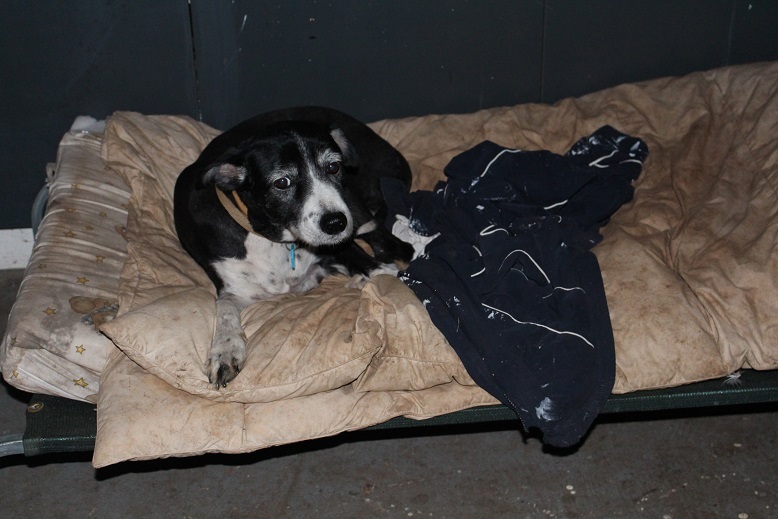 However, even this does not deter some people as evidenced by the burgeoning industry of off-site storage facilities. You can easily apply limits to things like your books by simply choosing not to have the shelves overflowing. As you buy or acquire new books, make space for them by moving others along. We all have books that we are not sure why we are keeping them. Will you read them again? No? Time to go. This way you will eventually end up with a selection of books that you really love and are proud to have on your shelves. Perhaps you can choose an arbitrary number such as 20 DVDs, 10 t-shirts or 6 champagne flutes. Make sure that you don’t simply choose a number that allows you to maintain the status quo. It needs to be challenging yet achievable as well as pertinent to your unique situation. No matter what the item, you need to ask yourself the question, “Do I really need x of this item?” Nothing needs to be immune from this process – lipsticks, plates, socks, CDs, towels, candles and cookbooks are all fair game. Once you set limits on your stuff and force yourself to choose, you will naturally choose ‘the best’. How you make that choice is a personal decision but making the choice means that you consider the merit of each piece carefully and you will appreciate its worth to you and your life. The stuff that makes the cut will have an opportunity to shine in the decluttered environment. It is not only physical stuff that you can set limits on. You can set limits on your participation in events. For example, you may decide that you will only spend one night a week playing sport, therefore you will choose the one you enjoy most. This may give you a chance to excel rather than putting in a mediocre performance in 3 different sports on 3 different nights of the week. You may choose to limit your association with people who do not enhance your life. Limits can be seen as restrictive but the limits you set on your stuff will actually be liberating as you are the one making the choices. Don’t let your stuff rule you and your life. We have been given a large number of titles for our Kindles so on the weekend I decided to check if some were double-ups of hard copies that we already owned. Sure enough, there were over 80 books that we already had on our bookshelves. Here are some of the books which we will be letting go. It will mean less to store, dust etc. We will even have some empty shelf space. I have listed some of the books to give away on a couple of sites including Freecycle but have not had any luck. If any of my Australian readers have suggestions as to where I can give them away where they will be appreciated that would be great. In fact, if you are interested in any and live in south-east Queensland or are prepared to pay postage please let me know and I can send you a list of the available titles. Tonight I want to share the result of some of my decluttering. 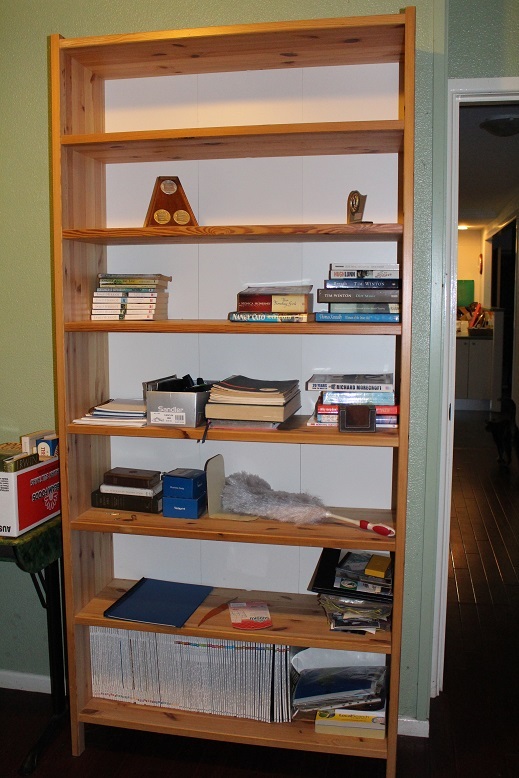 Here are the bookshelves in the study. I have finally got them pretty much as I want. It has taken ages to do and the study is still not finished. 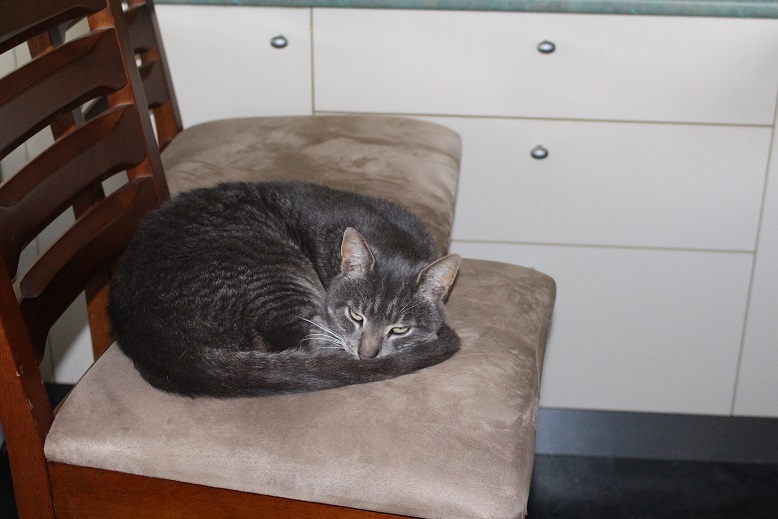 There is still ‘stuff’ on the desk which will stay there until I deal with it and make a decision because if I put it away it will never get properly sorted out. We have quite a lot of books and find it hard to part with them. I have managed to be a bit ruthless this time and hopefully we will not accumulate too many more as we both have Kindle e-readers now. I would recommend them to anyone who is trying to limit the physical books that they have on the shelf. 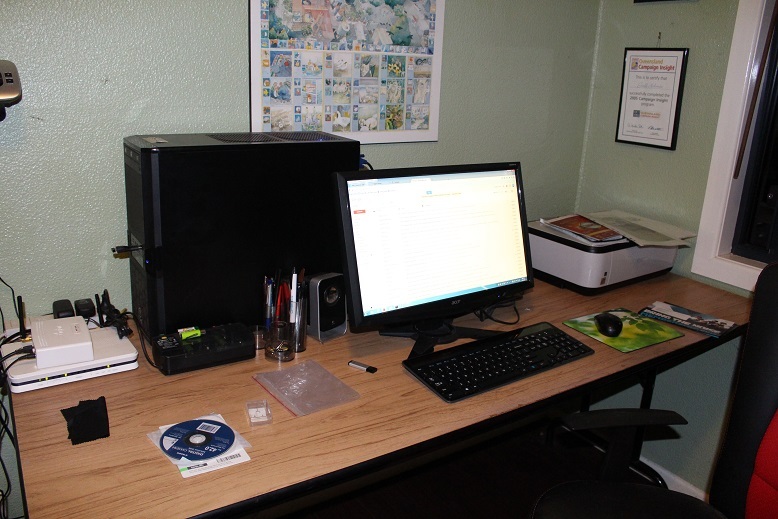 Do you have any technology that helps to reduce the clutter?